One small sentence written on the last postcard from Harold’s trip abroad is probably the most interesting of all. He wrote the postcard the same day Archduke Franz Ferdinand and his wife Sophie, Duchess of Hohenberg were assassinated in Sarajevo, an event we now view as the catalyst for the start of the war. I wondered how things were seen at the time, whether Harold and Walter might have had any inkling of what was so close on the horizon. Many of Britain’s historic papers are locked behind paywalls but the Daily Telegraph has digitised and released its WWI archival papers. Its June 29th, 1914 edition has a whole series of articles detailing the Archduke’s assassination (see pp 11-16). I also found an article from the Manchester Evening News available on the British Library’s newspapers site. Both reports fail to grasp the ramifications of the Duke’s death. Back in Canada the assassination was also in papers such as The Globe. There was no interpretation of the events there either, only details. Media coverage of the Archduke’s death continued for most of the week, but looking through the papers is is obvious that there were plenty of other things happening, other events that might be as just as interesting and relevant to two young men abroad. The suffragette movement was gaining media attention for their increasingly radical actions, the Irish Home Rule Bill was back in the House of Lords, Shackleton’s Antarctic expedition received a generous donation from Sir James Caird (see p. 13). On the same day as the assassination, there was also news of a commercial liner, the SS California running aground off the coast of Ireland on its way from New York to Liverpool. There was even mention of a heatwave (p.11) during the last week of their time abroad. In June, Winston Churchill lands at Portsmouth in an aeroplane. He’s taken a great interest in planes and their potential. He is learning to fly and starts building up the Naval wing of the Flying Corp.
Also in June, a British dirigible drops dummy bombs on Portsmouth dockyards to test its vulnerability to attack from German zeppelins. And what about the battleships Harold wrote home about? They may have seen some battleships in the dockyards being outfitted or repaired. It is just as likely they saw ships from the Grand Fleet arriving in harbour. The King had called for an assembly of the Grand Fleet at Portsmouth (see p. 11). 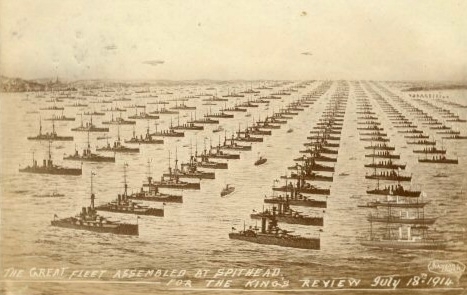 Over 200 ships assembled at Spithead for review from July 16th – 20th, just a fortnight after Harold and Walter sailed for home. The fleet would remain in near Portsmouth until late July when they would be ordered North in readiness for war. The days leading up to the declaration of war against Germany were interesting times and it is possible to get a clear idea of the news, the emotion and atmosphere from sites online. BBC Radio has a series of podcasts: 1914: Day by Day and there are many newspapers now digitised and online such as the Daily Telegraph. The papers are especially useful for zeroing in on local areas, to see how the news was reported to small towns, rural areas and big cities. Reading papers from 100 years ago can be a frustrating experience. Front page news hadn’t taken off as a concept in many publications (altho’ Canada’s Globe seemed to grasp the concept) so you may have to wade through a dozen pages of advertising first to get to the news. 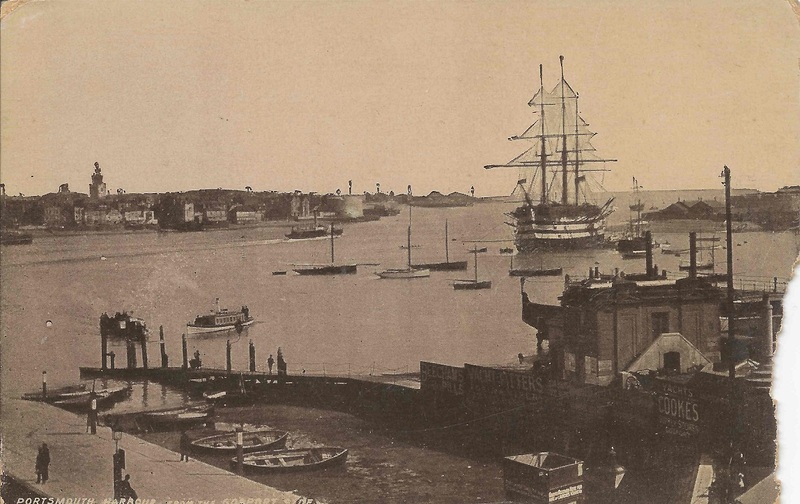 This entry was posted in Historical Perspective and tagged 1914, Archduke Franz Ferdinand, assassination, battleships, England, grand fleet, grandfather, history, Portsmouth, travel, Walter Cripps, WWI on August 13, 2015 by Catherine Hainstock.